Arsenal produced a dominant display against hosts Ajax on Sunday but had to settle for another goalless draw in the Amsterdam tournament. 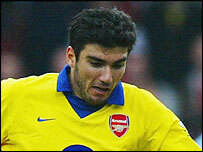 Striker Jose Antonio Reyes impressed again for the Gunners, who drew 0-0 with River Plate in Friday's match. But outstanding Ajax goalkeeper Maarten Stekelenburg pulled off a host of brilliant saves to deny the Spaniard. River Plate beat Panathinaikos 1-0 in Sunday's other game allowing Ajax to top the table for a fourth year.